We’ve heard it before about mobile or video…this year will be THE year. The year it matures, comes of age – becomes a key ‘marketing tool’. What are the challenges voice search faces in the marketing world? There’s no doubt that usage of voice control and voice search is growing, I’m not questioning that. I’m not going to drop links in here to studies citing that, they’re everywhere. For someone who works in marketing, the calls to adopt or utilise the latest technology trend can be deafening. A buzz of expectation and excitement that takes its lead from news stories and examples from mega brands – sometimes pushing the boundaries, but oft with huge budgets at their disposal. Spotted any opportunities for your brand or a client’s brand in those? Maybe the ‘best bar’ query, or the ‘broken toilet’ ones? Yes – I’ll give you those. If you’re able to offer an answer to either of those then you’re in with a chance. An extremely slim chance. A chance so small it’s barely visible. If you’re not feeling lucky, you might want to wait a bit. But if you’re still chomping at the bit and really feel like going for those ‘best bar’ and ‘broken toilet’ queries – you’re aiming for the top spot only. 2nd place is failure. No one will hear your answer unless you’re being selected as the one answer your voice assistant of choice chooses to provide. Much like the frequently ignored, “Are you feeling lucky?” option Google still gives real estate to on it’s main search page. That option takes you straight to the top organic search result without you having to visit the SERP first and click on it. 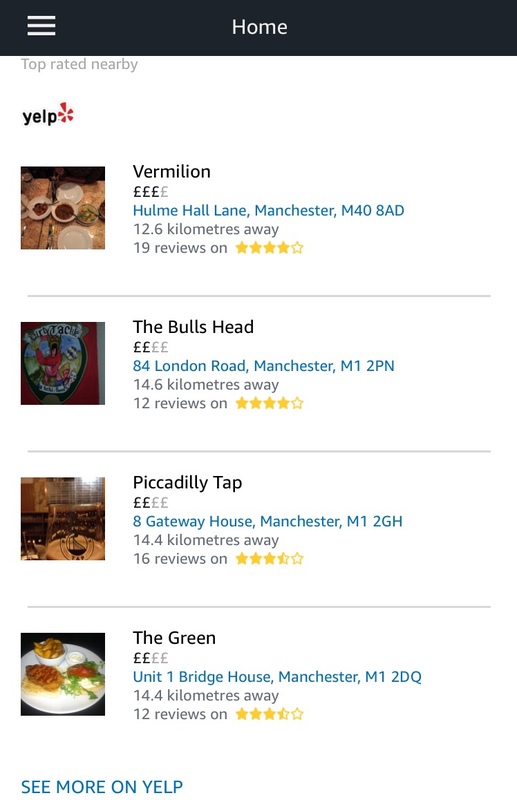 For that bar search example, Amazon’s Echo (the most popular voice assistant in the home across the UK so far) doesn’t speak any of the bar recommendations back to me, instead she tells me she’s sent a few to the app on my phone. Alexa uses Yelp for ‘bar recommendation’ type searches and the results are often pretty crappy. This is a list of the best bars in Manchester…apparently. Diverting me to the Alexa app on my phone to see their ratings or call them just feels clunky. The Google Home fairs slightly better. Asking Google “what are the best bars in manchester?” she replies to tell me she ‘knows some’ then speaks a list of three with their address. No information about which site she got that information from, or how ‘best’ was determined. Yay – marketing opportu…nope. That may sound odd. It felt odd to write. But hear me out. Google and Samsung have access to screens. Big screens and small screens. Google have Chromecast & Pixel (plus Assistant on other Android phones/tablets), and Samsung have Galaxy and their extensive smart TV range. Whilst Samsung’s Bixby voice assistant has come under some (deserved) scrutiny since launch, if they could get that right it feels like there’s a great natural fit there. Your phone’s in your pocket or on the counter somewhere, you ask, “Bixby, show me men’s trousers in black”. It either asks where you want to see them, maybe there’s a choice of more than one TV in the house, or still gives you a ‘view on phone’ option. Low and behold, a range of men’s trousers in black appear on the TV for you to look through. Control from then on could carry on via voice (“Bixby, show me the pair from ASOS”) and you can see how that becomes valuable. How would they get the content you ask – they’d need to build a web index ala Google or maybe take direct feeds from businesses who’d pay for inclusion. Sounds like a challenge. For those of you shouting “but Amazon has Fire Stick/Box for your TV!”, they do – but they’re not about to open that up to searching the wider web using your voice. They want you in the Amazon ecosystem. Bezos wants your cash badly folks. Google is smart and Google is patient. They know the battleground has always been search, and for the near future it’ll continue to be search. You could have the slickest voice search home device (or voice to visual search tie up) but without the quality of results you’ll never get long term user engagement. Google Pixel, Assistant on Android, Home and Chromecast (both hardware dongle and ‘built in‘) should give Google the reach it needs to connect your voice to their all conquering search engine. Great results on a variety of screens – all in a heartbeat. Eurgh…I sounds like a goddamn ‘Apple’ advert now, sorry. Apple, by the way, are well out of the race – their HomePod is crazy expensive and despite the folks over at Mashable rating it highly, they only really want it for the sound quality. Siri is a continuing disappointment and the heart of HomePod. I don’t think Apple can work their ‘magic’ with this one. So, if you’re in marketing, what can you do now? Want some reporting on how well you might be doing in voice search? Good luck. Maybe use GSC to look for question phrases or those that start with ‘OK Google’ – but even with some huge brands I see in GSC, there’s little to none right now. Unless you’re a huge recipe site, a recommendation engine or a tech giant like Google or Amazon – I’d be spending my 2018 marketing budget on something else. 5 reasons why Google My Business “Questions and Answers” needs to stop. Now. What would World Cup shirts look like with sponsors native to each country? I agree with all of this. I ran some tests at the end of last year (http://callismakesfilms.co.uk/blog/seo-marketing/voice-search-opportunity-nail-seo-coffin) and even on Google Home, which to its benefit cites the source, offers little value for marketing. Unless there is functionality to save to bookmarks/email digest/browser tab and read the full article there’s a lot of longtail search that could have eventually converted down the sh1tter! I’m an SEO with over 14 years experience working with everything from tech startups to industry-leading national brands in some of the most challenging verticals. This blog hosts some of my thoughts, tips, advice & experiences.